And it's...oh dear. 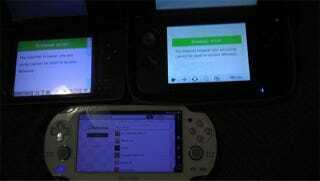 Up top, a pair of Nintendo 3DS units, below, a PlayStation Vita. Sony's browser lets you access Nintendo's online version of the Miiverse. Nintendo's own does not. Predictable, perhaps, but still worth a chuckle.